Who needs the Nevada Boater Education Card? All boaters Born after January 1, 1983 must have a Nevada Boater Education Card to operate any motorized watercraft over 15 HP. In Nevada, every vessel (except a sailboard) must have a Type I, II, III PFD onboard and readily accessible for each person on the vessel. The Nevada Department of Wildlife (NDOW) requires at least one U.S. Coast Guard approved Type IV PFD (ring buoy OR seat cushion) on all recreational boats in excess of 16 feet in length , in ADDITION to the wearable PFD required for each person onboard all boats. Someone being towed behind a vessel is considered to be onboard. All PWC occupants must be wearing their PFD while underway. Inflatable PFDs are not approved for children under the age of 16 nor are they approved for use during high impact sports such as waterskiing or operating a PWC. A Type V PFD may be substituted for any other PFD required onboard as long as it is specifically approved for the activity by the USCG. CHILDREN: All boaters or passengers 12 years of age and younger must wear their PFD while onboard vessels that are underway, unless in a fully enclosed area. In Nevada there is a minimum age requirement of 14 years old, for those who wish to operate a Personal Watercraft (PWC) while unaccompanied by an adult. Beginning Jan. 1, 2003, boaters born on or after Jan 1, 1983 are required to complete a boater education course before operating a boat on Nevada's interstate waters. This requirement applies only to operators using a motorboat with a motor exceeding 15 horsepower. Nevada's interstate waters include Lake Mead, Lake Mohave, the Colorado River from Davis Dam south to the California state line, Lake Tahoe and Topaz Lake. He/she has a blood alcohol content (BAC) level of .08% or more. He/she is under the influence of alcohol or any controlled substance to a degree that renders him/her incapable of safely operating the vessel. OUI convictions may face up to 6 months jail time and fines up to $1,000 plus court costs and testing fees. If an operator in convicted of OUI that results in the death or serious injury to another person, he/she will face felony charges that are punishable by fines up to $5,000 and imprisonment for up to 20 years. Operators on Nevada waters have given "implied" consent to evidentiary alcohol testing if an officer has reasonable suspicion. The NDOW is responsible for regulating the state boating laws in Nevada. All vessels propelled by machinery, including gasoline, diesel and electric motors, and principally operated on Nevada waters must be registered and issued a Nevada Certificate of Number (Registration) by the NDOW. It expires on December 31st on the year issued. Submit the application and appropriate fees to the NDOW for the: Certificate of Number, registration and boat title. Application forms are obtained by writing to the address above, calling 1-775-688-1500 or visiting one of the Department of Wildlife offices in Reno, Fallon, Elko, Ely, Las Vegas or Henderson. *Measured from the outside of the bow to the outside of the stern. Numbers and letters must be separated by a space or a hyphen. For example: NV 1234 BX or NV-1234-BX. This is a federal and state requirement. When received, decals must be placed within 6 inches of the registration numbers on each side of the boat. The decal must be in line with the registration numbers and extend toward the rear of the boat. Make sure all boats are properly marked and documented. It is important to keep your papers with the boat – be particularly aware when transferring ownership of your vessel. Non-native aquatic species, plants, fish and animals are invading Nevada's waters. These pests can increase dramatically under the right conditions, displacing native species, clogging waterways, and impacting navigation and recreation. Once introduced, they are nearly impossible to eliminate. Hydrilla, Egeria Densa, water hyacinth and zebra mussels are nuisance species that can be accidentally transported by recreational boaters when caught in propellers, intakes or attached to hulls. The Nevada aquatic invasive species (AIS) decal requirement became effective January 1, 2013 through approval from the Nevada State Legislature in 2011. The AIS decal requirement was established to prevent the spread of harmful aquatic species threatening Nevada’s waterways. The decal supports AIS monitoring and analysis, provides AIS prevention through outreach and education, and provides seasonal watercraft inspections and decontamination stations. The AIS decal also supports enforcement of AIS prevention laws. Many aquatic invasive species, including quagga and zebra mussels, have been transferred from one body of water to another through contaminated watercraft. Remember to always clean, drain and dry. 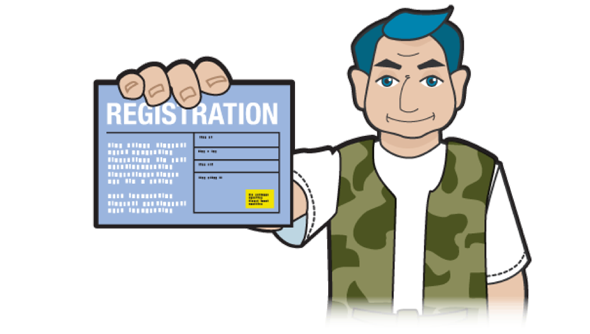 The decal requirement includes in and out-of-state motorized watercraft as well as most paddle-craft, such as canoes and kayaks. Watercraft that are capable of retaining water are required to display the decal. Paddle-craft, such as stand-up paddle boards and float tubes are exempt from the decal requirement. The Nevada Boater Education Card (also referred to as the Nevada boating license) is proof that a boater has taken and passed an approved boater education course. The Nevada Department of Wildlife currently has a mandatory boater education requirement that requires all boaters born on or after January 1, 1983 who operate a powered watercraft over 15 hp to have the Nevada boating license on board when the vessel is underway to satisfy the Nevada boating regulations. Many boating fatalities occur because boaters aren't educated about boating safety. The Nevada Department of Wildlife believes that an educated boater is a safer boater. Q. Where can I take my safe boating exam and get my Boater Education Card? A. You can write your safe boating exam directly on the Internet at BOATERexam.com®. Once you pass the exam your boater education card is mailed to your home. In the meantime, you can print off a Certificate of Completion that can be used as a temporary license to satisfy the Nevada boating regulations until your permanent boater education card arrives. Q. Where can I get the boater safety education course material? A. All the required safe boating training material to get your boater education card is available at BOATERexam.com®. Simply visit our Nevada Safe Boating Course section to gain access to the training material. The Nevada Safe Boating Course is accredited by the Nevada Department of Wildlife. Q. Where can I get more information about Nevada boating regulations and the Nevada boater education card? A. Answers to most of your questions about the Nevada Boater's License can be found on our Frequently Asked Questions page. You may also visit The Nevada Department of Wildlife for additional information, or you can contact us and we will be glad to answer any of your questions. Get your Nevada Boating License Online! A. Many boaters incorrectly use the term "Nevada Boating License" when referring to their Boater Education Card. The Boater Education Card is NOT a boating license. Unlike a driver's license, your Boater Education Certificate cannot be revoked and is good for life. 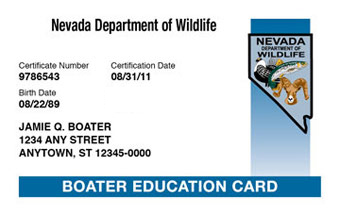 A Nevada boater education card is required for all persons born on or after January 1, 1983 who operate a powered watercraft over 15 hp on Nevada's interstate waters, including Lake Tahoe, Lake Mead, Lake Mohave and Topaz Lake. The operator as well as all passengers of a PWC must be wearing a Coast Guard approved PFD. PWC operators must carry a USCG-approved fire extinguisher and a sound-producing device onboard. When towing someone on a tube or on water skis there must be capacity on the PWC to accommodate the operator, the observer as well as the tuber/skier(s). Vessels nearing each other must operate at wake speed when within 5 lengths of the longest vessel. This eliminates wake jumping. Vessels within 200 feet of a beach frequented by swimmers must operate at no-wake speed. (This rule applies to all powered vessels). When operating a boat equipped with an engine cutoff lanyard, boaters are required to wear the device anytime the boat is moving at a speed greater than a no wake speed (5 mph). The engine cutoff lanyard, sometimes referred to as a "kill switch" is a short piece of string or coiled material that connects to the boat operator and to the boat console. When the operator falls overboard or otherwise moves too far from the helm, the lanyard is pulled free and the boat engine is automatically shut off. PWCs may only be operated between the hours of sunrise and sunset unless equipped with the proper navigation lights. No one under the age of 14 can operate a PWC on Nevada waters.